The Saint John River is a 673 kilometres (418 mi) long river that flows from Northern Maine into Canada, and runs south along the western side of New Brunswick, emptying into the Atlantic Ocean in the Bay of Fundy. Eastern Canada's longest river, its drainage basin is one of the largest on the east coast at about 55,000 square kilometres (21,000 sq mi). A tributary forms 55km of the border between Quebec and Maine, and much of the border between New Brunswick and Maine follows the river. New Brunswick settlements through which it passes include, moving downstream, include Edmundston, Fredericton, Oromocto, and Saint John. It is regulated by hydro-power dams located at Mactaquac, Beechwood, and Grand Falls, New Brunswick. Samuel de Champlain visited the mouth of the river on the feast day of John the Baptist in 1604 and named it the Rivière Saint-Jean, now known in English as the Saint John River. Many waterways in the system retain their original pre-European names. The Maliseet called it the Wolastoq, meaning bountiful and good and seek to restore this name. 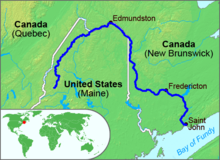 The headwaters are in the New England/Acadian forests of Maine and Quebec, including the Southwest, Northwest, and Baker branches, and the Allagash River flowing into New Brunswick at Edmundston where it is joined by the Madawaska River. The middle section runs from the confluence of the Aroostook and Tobique rivers, flowing southeast to Mactaquac Dam. Other tributaries in this section include the Meduxnekeag River. This area is the only place in Atlantic Canada where Appalachian Hardwood Forest is found. Plants rare for the province include wild ginger, black raspberry, wild coffee, maindenhair fern, showy orchis and others. This forest type, also known as the Saint John River Valley Hardwood Forest, once spread of much of the area and has been reduced to less than one percent of the land area because of human activities. This is an area of rolling hills and soils that are the most fertile and heavily farmed in New Brunswick. Soils are fine, loamy, and well-drained glacial tills overlaying limestone and sandstone. The climate here is drier and warmer than surrounding regions. The lower basin, 140 kilometres to Saint John Harbour on the Bay of Fundy, consisting of lakes, islands, wetlands and a tidal estuary. Tributaries in this section include the Nashwaak and Nerepis rivers and Belleisle Bay. The final tributary, the Kennebecasis River, is a fjord with a sill, or rise in depth near the mouth of a fjord caused by a terminal moraine. From Grand Bay, the waterway becomes narrower and deeper forming a gorge where at the Reversing Falls incoming tide forces the flow of water to reverse against the prevailing current. A wedge of salt water, below a surface covering of fresh water, extends upriver to the 10m shallows at Oak Point beyond which it cannot advance. The drainage basin is 55,000 square kilometres (21,000 sq mi), of which 20,000 square kilometres (7,700 sq mi) is Maine. The average discharge is 1100 m3/s. Water flow is lowest in the autumn, and considerably higher than average during the spring freshet at 6800 m3/s. In early spring, upper sections of the river can experience ice jams causing flooding. In the lower sections in the broader floodplain, flooding may occur during late spring from the volume of water which must make its way through the narrow gorge at the Reversing Falls. Legally, all of the river downstream of a point between Fredericton and Mactaquac Provincial Park is considered tidal. The river is mostly calm, except for waterfalls at Grand Falls and at the Beechwood Dam. With the water flow in the spring being six times the average rate, the valley has always been prone to flooding in the spring. Surface runoff from heavy rainfall is the main cause of flooding, and can be exacerbated by ice jams, high tides, and rapid snowmelt. Floods have been documented for more than 300 years. Flooding has occurred in Edmundston, Grand Falls, Perth-Andover, Hartland, and Woodstock, and most severely around Fredericton. Major flooding has occurred in 1923, with water 8 metres above normal winter low. In 1936 high temperatures quickened snowmelt, and heavy rain raised the water level to 8.9 metres, about 7.6 metres above summer level. Similar circumstances led to the same level of high water in the 1973 flood. In the 2008 flood the water level reached 8.36 in Fredericton. Similar flooding occurred again in 2018. The severity and frequency of flooding is expected to increase, with climate change. It is predicted that New Brunswick's average temperature will increase by 5 C by the year 2100, and that precipitation will increase. At the end of the last glacial period, following the retreat of the Laurentide Ice Sheet about 13,000 years ago, the area was stripped bare of vegetation and soil. By about 10,000 years ago, Paleo-Indians probably occupied what is now New Brunswick. Although the basin has been subject to human influence for thousands of years, the Maliseets' impact was minimal partly because of their small numbers, and partly because they practised low intensity agriculture. Major disturbances did not begin until the early 1800s with the arrival of large numbers of Europeans. When the Europeans arrived, they found that the Saint John River basin was the homeland of the Maliseet tribes, who practiced hunting and gathering and farmed near the banks of the river. European colonists may have used fields and town sites prepared by the natives. Archaeological evidence is that the Maliseet had economic and cultural ties with large portion of North America. The Maliseet dealt with freshets by having their village above the floodplain, for example Meductic, while cultivating at a lower elevation where the fields were fertilized by the floodwaters. The Maliseet were highly mobile and the Saint John River was a primary means of transportation. While the Maliseet saw themselves as part of the ecosystem, the Europeans' Judeo-Christian world view held nature and humans are separate, and that nature is there to be exploited. During the 1600 and 1700s, French colonists populated the lower river valley as part of Acadia, with Fort Nashwaak in present-day Fredericton, Fort Boishebert at the confluence of the Saint John and Nerepsis rivers. In the French seigneurial system lands were arranged in long, narrow strips, called seigneuries, along the banks of the river. However this was not practical given the seasonal flooding, and the Acadians moved to higher ground. Decades of warfare between the British colonies in what is now New England and Acadia, led to the expulsion of the Acadians in 1784. Following the American Revolutionary War, United Empire Loyalists settled the area. Returning Acadians settled the upper valley. Large numbers of people began settling the area in the early 1800s, mostly Scottish and Irish, and by the end of the 1850s much of the central Saint John valley had been cleared of old-growth forest for farming. Francophone Quebecers moved into the northern areas. In the interwar period, many of these farms were abandoned due to urbanization, and allowed to reforest. Before the advent of railways, the river was an important trade route, including timber rafting. In 1925 a hydroelectric dam was built at Grand Falls, followed in 1955 by the Beechwood Dam and the Mactaquac Dam in 1965. Large reservoirs were created behind the dams. Construction of the latter two dams has caused a severe decline in migrating Atlantic salmon, and resource authorities have developed fish ladders and other measures to try to revive the migration. In 2011, the entire watershed was designated the Wolastoq National Historic Site of Canada by National Historic Sites of Canada and is as the traditional territory of the Wolastoqiyik First Nation. The forested areas of the Maine North Woods where the river rises is mostly uninhabited. The Northwest Aroostook, Maine unorganized territory has an area of 2,668 square miles (6,910 km2) and a population of 10, or one person for every 267 square miles (690 km2). Great Falls on the River St. John, New Brunswick, by Henry Holland, c. 1782. ^ a b c "Saint John River". The Canadian Encyclopedia. Retrieved 27 December 2018. ^ Esrock, Robin. "St. John River Valley". National Geographic. Retrieved 27 December 2018. ^ "St. John Watershed". Maine Rivers. Retrieved 27 December 2018. ^ MacGregor, Roy. "Fishing for answers". The Globe and Mail. Retrieved 27 December 2018. ^ "Saint John River". Natural Resources Canada. Government of Canada. Retrieved 27 December 2018. ^ "St. John River: The Good and the Bountiful". Canadian Geographic. Retrieved 27 December 2018. ^ Poitras, Jacques (June 8, 2017). "Maliseet want name of St. John River changed back to 'Wolastoq', but no consensus on spelling". CBC News. Retrieved July 21, 2017. ^ "Appalachian Hardwoods". Nature Trust of New Brunswick. Retrieved 28 December 2018. ^ "Ecology". Meduxnekeag River Association. Retrieved 28 December 2018. ^ a b c d e f MacDougall, Andrew; Loo, Judy (1998). "Natural history of the St. John River Valley hardwood forest of western New Brunswick and northeastern Maine" (PDF). Government of Canada. Atlantic Forestry Centre. Retrieved 29 December 2018. ^ "Lower Saint John River". UNB Engineering. Retrieved 27 December 2018. ^ a b Clarke, John; Winistock, John. "Kennebecasis -Grand Bay Sill: A view of the salt and fresh water exchange in the lower St. John River". University of New Brunswick. Retrieved 27 December 2018. ^ "Tidal Waters". Government of New Brunswick. Retrieved 29 December 2018. ^ Government of New Brunswick, Canada (2015-09-11). "Flooding in New Brunswick". www2.gnb.ca. Retrieved 2018-12-31. ^ Apr 30, Julia Wright · CBC News · Posted:; April 30, 2018 5:41 PM AT | Last Updated:. "Worst floods in New Brunswick history: how 2018 compares | CBC News". CBC. Retrieved 2018-12-31. ^ "New Brunswick's Flood Risk Reduction Strategy" (PDF). www2.gnb.ca. Retrieved 2018-12-31. ^ "Key climate-change vulnerabilities identified for three St. John River communities". Canadian News Wire. Retrieved 27 December 2018. ^ "Scientist says record floods show that New Brunswick must adapt to changing world | Globalnews.ca". globalnews.ca. 2018-05-07. Retrieved 2018-12-31. ^ Foot, Richard (2010). "Prehistory". Retrieved 27 December 2018. ^ a b Dalton, Shawn (2015). "A social ecological history of the st john river watershed". Retrieved 29 December 2018. ^ "Wolastoqiyik (Maliseet)". The Canadian Encyclopedia. Retrieved 27 December 2018. ^ a b Hall, Jason (2015). "Maliseet Cultivation and Climatic Resilience on the Wəlastəkw/St. John River During the Little Ice Age". Acadiensis. Retrieved 27 December 2018. ^ a b Hall, Jason. "The Environmental and Cultural History of the St. John River". NICHE. Retrieved 28 December 2018. ^ "Wolastoq National Historic Site of Canada". Parks Canada. Government of Canada. Retrieved 27 December 2018.